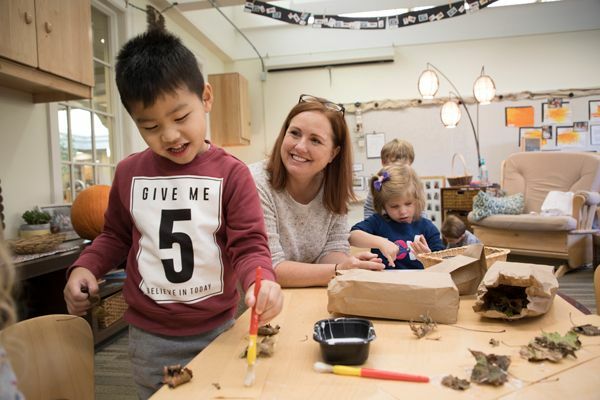 Hawken School is guided by our Purpose, Promise, and Principles, which affirms our School’s long-standing mission of the development of character and intellect and forward-focused preparation for the real world. As we prepare our students to enter a new and ever-changing world, our 3 P’s ensure that we continue to proactively empower our students with the skills and traits required to navigate a complex and dynamic world with self-confidence and determination. Hawken School prepares students to navigate a complex and dynamic world with self-confidence and determination; embrace challenges with disciplined analysis and creativity; and engage others with empathy and integrity. We truly know our students as learners and individuals. We consider developing the intellect to be a critical part of developing character and, as such, we expect the highest levels of academic excellence and work ethic from our students. We orient our program with a primacy toward the development of essential skills beyond the acquisition of specific knowledge. We use classroom methods that place the student at the center of learning. We teach children to make choices, manage their time, think critically and creatively, and develop ownership for their learning. We believe students find energy and passion through engagement, and we expect them to participate and contribute meaningfully in an array of activities outside of the classroom. We believe in the power of community, and foster connections through teamwork, partnerships, and shared experiences. We appreciate difference and individuality, and embrace diversity in our community. We believe students need authentic experience in the real world to make meaning from knowledge. Nature, Cleveland, and the global community are extensions of our classrooms. We believe that to provide the most relevant education possible, our faculty and administrators must be learning continually about educational best practices, advances in technology, and developments in the world. Hawken School’s original rule book nearly one hundred years ago consisted of two words: Fair Play. Signs depicting the motto were hung in every classroom, and if the spirit of Fair Play was violated, the sign would be temporarily removed from the walls. Today, you will still find Fair Play signs on the walls of all Hawken classrooms – a reminder of our school’s emphasis on the importance of character. The concept of Fair Play remains at the core of our community’s collective consciousness, along with our founder James A. Hawken’s original goal for his students: “That the better self shall prevail and each generation introduce its successor to a higher plane of life.” These guiding principles and shared beliefs, which apply to academic, athletic, personal, social, and professional conduct, keep our community grounded in integrity, accountability, and respect. On behalf of the Board of Trustees, I am happy to share with you Hawken’s 2018 Strategic Plan, designed to guide us in our work over the next five years. While we have made tremendous strides meeting the goals established in our 2012 strategic plan, many are works in progress that will require additional attention in the years ahead for them to be fully realized and implemented. As you will see, our focus is on “fulfilling,” “deepening,” “refining,” “maximizing,” and “securing” goals that are already well underway. For example, moving Hawken to a stronger fiscal position is part of every strategic plan because it is essential to our ability to withstand potential setbacks in our nation’s economy and continue to fund initiatives that will keep Hawken at the forefront of independent education. Likewise, staying abreast of new advancements in technology and pedagogy will always be a priority, as that is paramount to Hawken’s commitment to remain on the cutting edge of best practices. Maintaining Hawken’s position as a thought leader demands that we fulfill our goal of organizational excellence and pay particular attention to the well-being of community members, use of time, compensation, and more. The updated strategic plan also includes some new areas of focus identified by sub-goals. Now that our merger with Birchwood is about to enter year three, we are dedicated to finding new ways to foster a spirit of one community among and between our campuses; we plan to explore and implement ways to make learning more personalized, with an increased focus on mastery and student choice; we intend to enrich our programming in athletics and team-based activities; and we will continue to develop more experiential, hands-on learning opportunities to maximize student preparation for the real world. These are just a few of the strategic highlights that project what lies ahead. As you read through the updated plan, you may notice that one of the major goals identified has not been referenced in previous plans: “Deepening Fair Play: Diversity, Equity, and Social Justice.” Fair Play has been an integral part of Hawken’s fabric since the School’s inception and encompasses a range of definitions and interpretations — but at its core, it incorporates the broad spectrum of traits that epitomizes a person of character. Because the development of these traits continues to provide the foundation of a Hawken education, the board has decided that it is time to devote more institutional time and energy to a particularly relevant aspect of Fair Play in today’s society, social justice. Work is already underway with plans for a Fair Play Initiative, the drafting of a Hawken School Diversity Statement, and the creation of a new position to be in place for the 2018-2019 year, Director of Fair Play. This new director will help to articulate the Fair Play Initiative, oversee the development of curriculum and programming that addresses all aspects of Fair Play, and work toward enhancing diversity among our faculty, staff, and student body. As you can see, even though we are in a very strong position, fiscally and educationally, our work continues. I remain ever grateful to our board members, administration, teachers, and families for their continued support as we work together to make these strategic priorities a reality. We are confident that focusing on these areas will secure the future of Hawken School as a leader and innovator in a world that desperately needs the kind of education Hawken delivers.